يوفر D'Altons Resort خدمة الواي فاي المجانية وغرف مع تكييف في Halls Gap. تشمل المرافق المختلفة مسبح موسمي في الهواء الطلق وملعب تنس. يمكن للضيوف الاستفادة من مرافق الشواء. تم تجهيز جميع الغرف في المنتجع بمنطقة جلوس. وتحتوي كل غرفة على حمام خاص مع حوض استحمام ولوازم استحمام مجانية ومجفف الشعر. توفر الغرف للضيوف خزانة ملابس وغلاية. يوفر D'Altons Resort ملعب للأطفال. تقع أرارات على بعد 49 كم من مكان الإقامة. We enjoyed our stay. Beautiful picturesque setting. Enjoyed the visits by the various bird life and local kangaroos. The cabins are old but comfortable, but could benefit from a serious spring clean. Welcoming and friendly hosts. 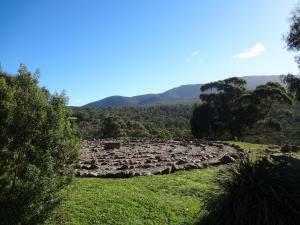 Very convenient for a quick explore of the Grampians. We were en route to Adelaide from Melbourne so this was a good break of journey. 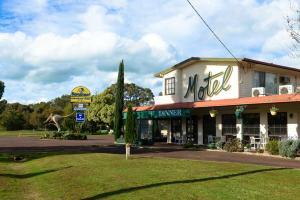 It's a beautiful place with kangaroo hopping at the garden, nice resort but kitchen is a bit outdated but the rest is good. We stayed at D'Altons Resort for 3 nights in a family cotage. It's very conveniently located just outside the cenre of Halls Gap. Very easy to get around and beautiful views of the mountians! Kitchen was well equiped, it had a wood fired heater :) (as well as an air conditioner / heater) and kangaroos galore at dusk. All together a fantastic long weekend away! Very nice cottages for a couple. Close enough to town centre to walk but far enough from the hustle and bustle. I'd stay here again. The jacuzzi was great and the bed has heater which is great during their cold weather. There was 2 resturants nearby (2mins drive) which was highly recommended by the owne and was good. 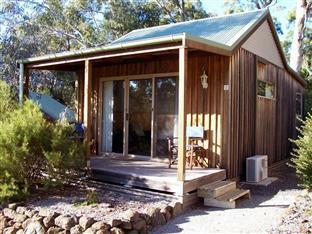 Halls Gap is a perfect base for exploring the Grampians, and the resort is very comfortable and well-equipped. Dinner for 5 was prepared with ease with what was provided in the cabin. The highlight of the town was the abundance of wildlife and how close they can be. The allocated cabin faced an empty field where dozens of kangaroos gathered in the evening. I'm surprised they could keep the place relatively free from the roo droppings as they'll literally come up to your door. Great relax stay with excellent environment and friendly staffs.